· Explore the 8 chakras and their connection to writing: acceptance, creativity, willpower, self-love, expression, intuition, elevation, receptivity. · Play with prompts & exercises that help get your vision on the page. · Face creative fears and develop a power statement to anchor you when you sit down to write. · Learn a powerful take-home meditation to incorporate into your writing practice. · Experience the limitless space where you can write freely. This workshop provides an in-the-moment experience of creative openness, as well as tools that will help you carry this limitlessness into your ongoing writing practice. "A space was created to allow easy free-flowing writing. A great group of women." "Great mood and tone set by Leah and Heidi--relaxed, thoughtful, open..."
"Perfect pairing of yoga and writing/creativity." "The small group size was intimate. Great energy sharing, great synergy between sisters." "Thank you--a wonderful experience, and A+ on the snacks!" Kundalini Yoga uses simple, powerful tools of Mantra (sacred sound), Mudra (hand gestures), Pranayama (breath control), Asana (posture), and Meditation (mindfulness), organized into sets called Kriyas ("a complete purposeful action"). Each Kriya is designed to generate a specific result. We work with a Creativity Kriya integrated with powerful writing and meditation exercises that together yield transformational results. Sister team Leah and Heidi Reimer create a safe, relaxed environment for inner work and group sharing. 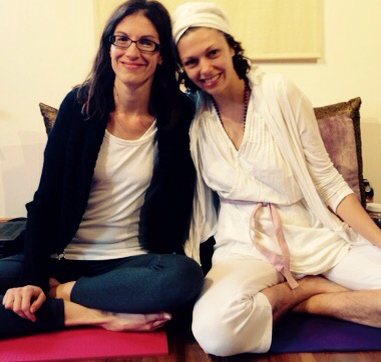 Leah is a certified Kundalini yoga instructor whose classes are soulful and transformative. She’s also a painter, fashion designer, seamstress, singer and all-round creative person. Heidi is a writer of fiction and creative non-fiction with decades of experience learning to get out of her own way and get words on the page. Sign up here for news of upcoming workshops.